A few years ago, I’d joined the Society of the 3rd Infantry Division after meeting and helping CPT Monika Stoy and LTC Tim Stoy with the Operation Dragoon and Colmar Pocket reunions/commemorations/seminars. I’d developed an affinity for the 36th Infantry Division when I was assigned that as my research task, enhanced tremendously when my good friend, SGT Russ Littel deployed with the 136th MEB, of the 36th ID, to Afghanistan. I was utterly shocked then, a few days ago when my sister dropped me a note asking if I knew anything about the 15th Infantry Regiment. 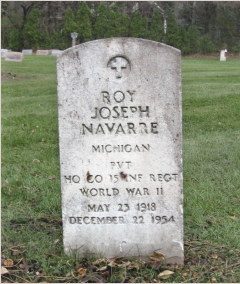 It turns out that our father’s uncle, Roy Joseph Navarre, served in Headquarters Company of the 15th Infantry Regiment during World War II. My father, Russ Navarre, never met his uncle because he was raised in the St Francis Home for Boys (which unfortunately burned in 2011 and was demolished). So, this comes as news to all of us. Fortunately, Tim is the historian of the 15th Infantry, so I fully expect to be able to learn far more about Uncle Roy. For those who don’t know the story of the 15th, or it’s parent unit, the 3rd Infantry Division, in World War II, it fought in North Africa, in Sicily, at Anzio, landed in southern France (Operation Dragoon! ), fought up the Rhone River valley, then through the Colmar Pocket and into Germany. I’m not sure when Roy Navarre joined the Regiment or if he remained in Europe to the end, but it will be interesting to discover and explore. Now, I can join the 15th Infantry Regiment Association as well! As I’d mentioned, I was able to attend the reunion of the Anzio Beachhead Veterans over the past few days, and it was a wonderful experience. Having helped with the Operation Dragoon and Colmar Pocket events, I was already familiar with the logistics of wreath-laying at the Tomb of the Unknown, so I was able to be more helpful than I’d expected. One of the first things we did on arriving at the Amphitheatre was to visit Audie Murphy’s gravesite, which is right across the street. We were able to get the four veterans who would be in the wreath-laying grouped around Murphy’s headstone for photos. There were a dozen or so other visitors who happened along at the same time and our veterans got a wonderful experience of being “rock stars” with gratitude from everyone and requests for photos. It was a wonderfully heart-warming experience for me, seeing these men thanked and seeing the tourists get such a treat – to meet men who served with Murphy when visiting his gravesite. I was able to bring along my own M1 Garand to the banquet and in this photo, you can see George holding what they all remembered as having been a far lighter weapon 69 years ago. George had enlisted in the Army and been assigned to the 9th Cavalry Regiment. Yes, George was a Buffalo Soldier, but when the Regiment reached North Africa, it wasn’t long before the Army decided to break up the unit. George ended up as a Sergeant in the 401st Port Company, unloading ships at the Anzio beachhead among many other places. He ended up making a career of the Army, retiring in 1967 as a Major, having served 24 years. To George’s right is Billie Stone of the 39th Combat Engineers. Billie’s unit was, like George’s, not organically part of a specific larger unit, so they moved wherever the engineering work, or at times, the need for riflemen, was found. Louis Kinofsky, C Company, 133rd Regiment, 34th Infantry Division, asked at the banquet when I handed him the M1 if he was going to get to take it home. Fortunately, he has one of his own there, so I get to keep mine. He had a lot of interesting stories, suggesting that when I read certain veteran memoirs, I take things with a very large grain of salt. I sat with Frank and his wife at dinner and he related that despite this being the 34th reunion held by the Anzio veterans, it was the first he’d attended. Shortly after the war, He’d been to a few reunions of his unit, but since they’d always been held in the same location, after a few years, numbers dwindled as people hadn’t wanted to always visit the same place. Ralph Joe Reid also served in the 34th Infantry Division, having arrived as a replacement before the Battle of Monte Cassino. When I sat talking to Joe on Thursday night, we talked about the aftermath of that battle. When his company was relieved by an Indian unit (I guessed Gurhkas, but am not sure), Joe, 13 other men and Captain Garfield were all that were left of his company. He also heaped praise on the 3rd Infantry Division, as the 34th replaced the 3rd and enjoyed their well-constructed foxholes in the Anzio perimeter. Joe said it was like living in the Sheraton after having only piles of rocks as protection at Cassino. Current President of the organization, Ed Benezech, was a field artilleryman in the 141st Field Artillery Battalion, but when I had him pose with the M1 for photos in front of the organization, he went through an impromptu manual of arms. He’d drilled men with the rifle enough times that he felt completely comfortable with it. John Boller, second from the left, is a former President of the group and it was through John’s notices in the Society of the 3rd Infantry Division newsletter, Watch on the Rhine, that I’d learned about the reunion. Without John, I’d have never known about it. His service with the 3rd ID during the war has continued in these decades since, and, as I said, seeing John explain to those tourists that he’d served with Murphy (though not known him personally) is a memory I’m sure they will treasure, as I know I will. Among the issues discussed over the weekend was the continuing existence of the organization. With so few veterans still living, these organizations are turning to the children and grandchildren of the veterans. The organization’s modern website was designed by Bob Rickmeyer and we were joined by Barb Bossi and her brother, who have started work on a Anzio Families website that everyone will work to integrate into the existing setup. Hopefully, the energy of everyone can be harnessed for a grand reunion down in Orlando to celebrate the 70th anniversary next year. At the far left of the photo is Louis Amato, who’d served as a medic in the 45th Infantry Division and then continued serving as a medic in POW camps after he’d been captured. Like most of these men, he’s quite a spark plug, the energy and humor bursting from him. As I attend these reunions and meet these men, I am always struck by the obvious bonds they have for each other. While none of them knew each other during the war and some hadn’t met the others even before this event, they’d all been the same places and seen the same dangers. In the years since, those experienced shaped them, but when they have the chance to be around others who understand, it’s always good. Sitting with them and talking, knowing some of the context or being able to let them handle their weapons or uniforms from the war brings them to a comfort level where, as Joe said to me Thursday night, they can talk about things they’ve not spoken of for 69 years. Sometimes, their eyes light up and they speak with great animation about their comrades and the good times, or they pause, remembering those who never came home. At a dinner party once, a woman asked me how I could devote so much study to something so terrible as war. For me, it’s the stories about people. While I enjoy studying the campaigns and knowing which units went where, the truly compelling thing is the people. War brings out extremes of the human condition – men doing terrible things and men doing completely selfless things. 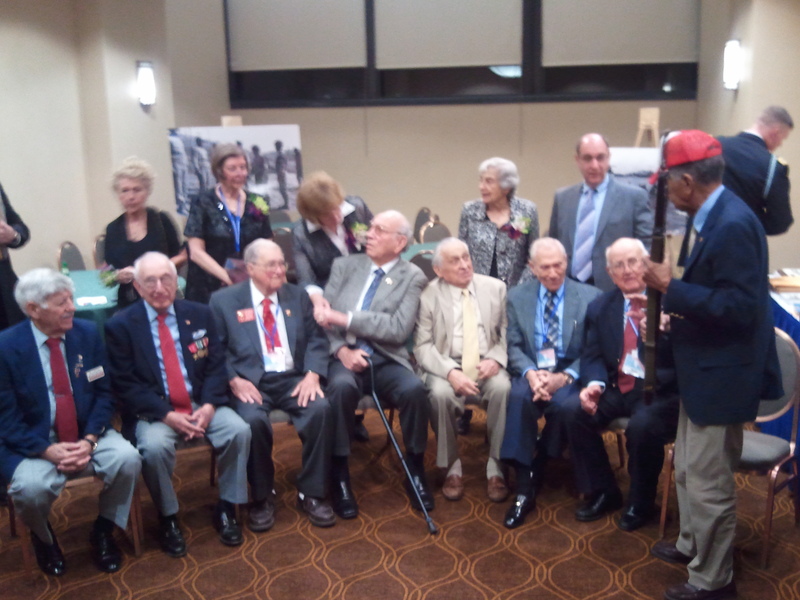 Tonight, I sat down for dinner with a handful of veterans of the Anzio beachhead. I’ll be spending a few days with them and hearing, then passing on their stories. Meeting them is almost beyond words. Some of their stories have been bottled up for 69 years and it is a true honor to sit with them. Details to follow….